The Springfield Co-Operative Bank building at 81 State Street, Springfield, Mass, around 1938-1939. 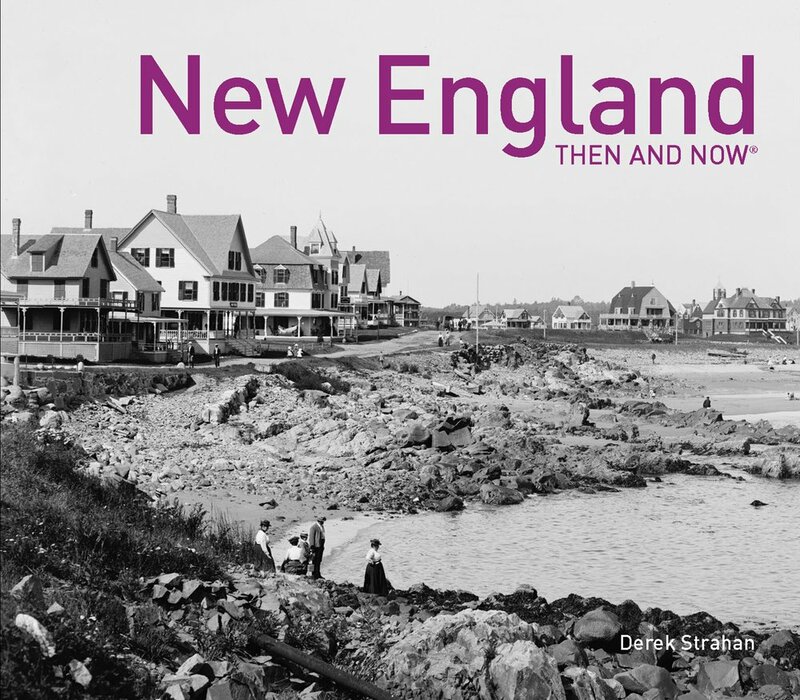 Photo courtesy of Springfield Preservation Trust. This building at 81 State Street was built in 1888 as the home of the Turnverein Society, a German-American social club. In the 1920s, the façade was renovated in line with contemporary styles, although the rest of the building reveals the earlier architectural design. By the time the first photo was taken, it was Springfield Co-Operative Bank, and the building continued to be used as a bank until at least the 1980s. 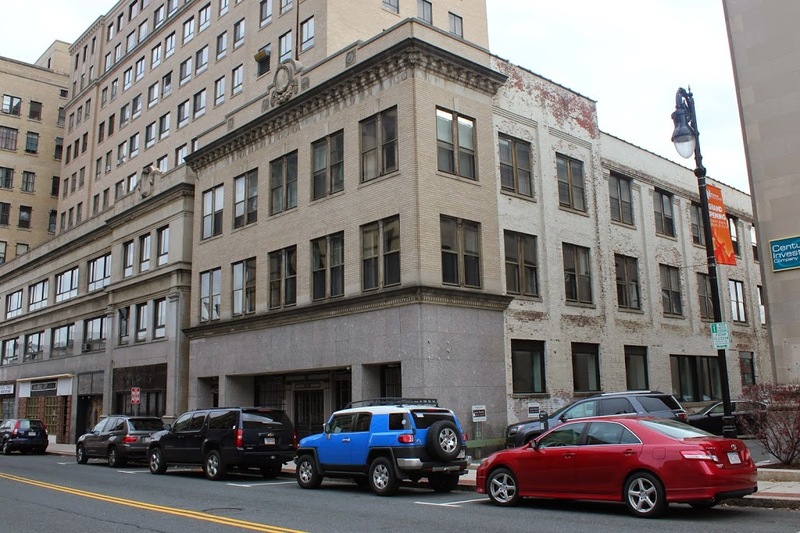 Today, the building is within the footprint of the planned MGM Springfield casino, and will be demolished, along with the tall annex to 1200 Main Street, which is seen directly behind the Turnverein Block. 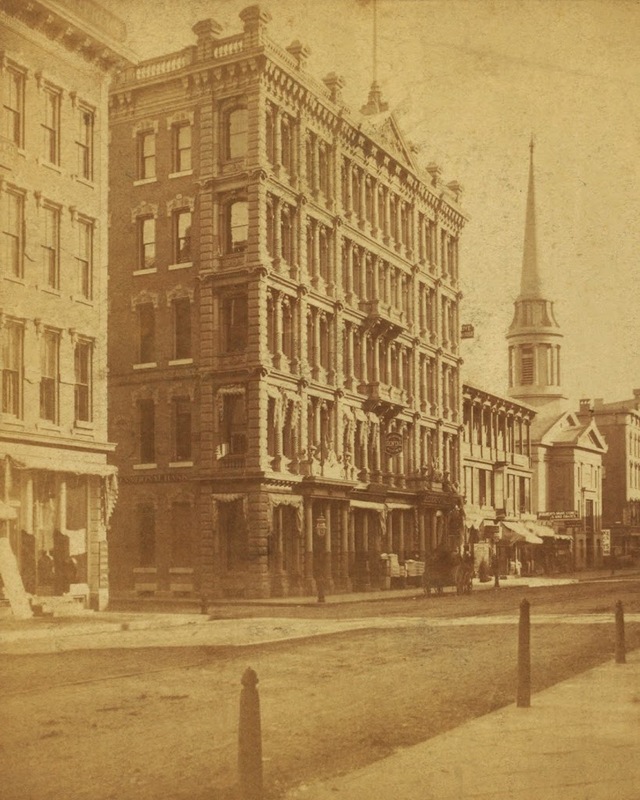 The view looking from Court Square toward the corner of Main and Court Streets, around 1878-1885. Photo courtesy of New York Public Library. 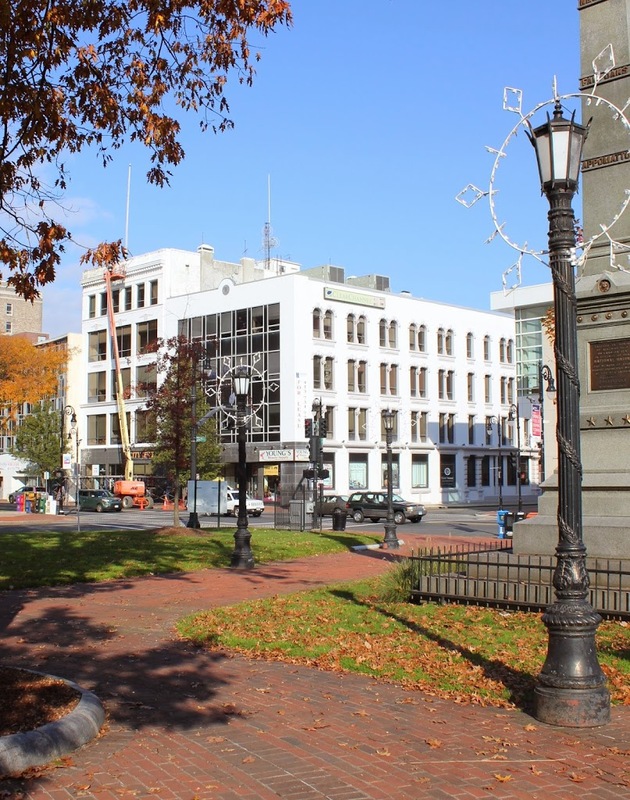 The ornate building in the center of the first photo is the Springfield Five Cents Savings Bank, which was built in 1876 at the corner of Main and Court Streets, diagonally across from Court Square. The building is still there, although the Main Street facade was completely renovated at some point in the past 50 years or so. However, the Court Street (today Falcons Way) facade is still largely intact, and reveals the fact that this building is not just another nondescript mid-20th century commercial building in the city. 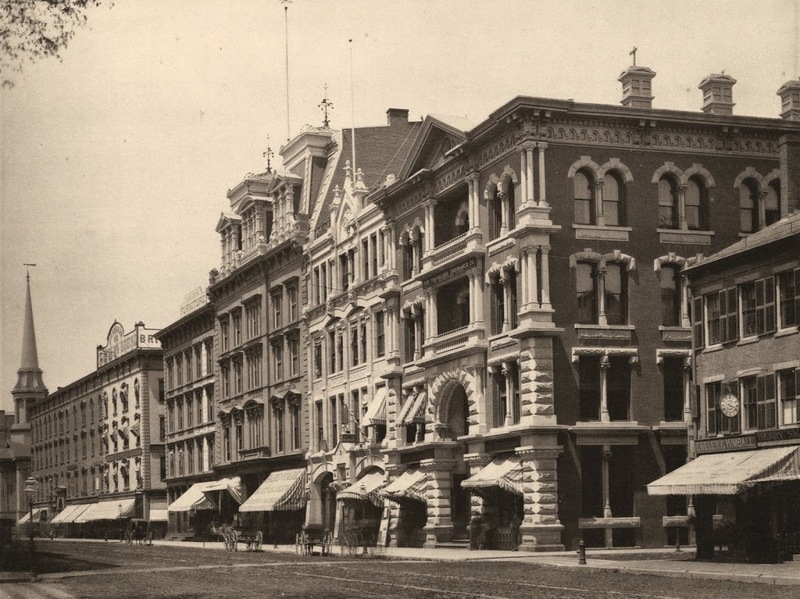 Next to the Five Cents Savings Bank building in the first photo is the 1878 Republican Block, which was the home of the Springfield Republican newspaper. I don’t know what happened to the building, but it apparently isn’t there anymore, unless it was renovated even more than its neighbor was. 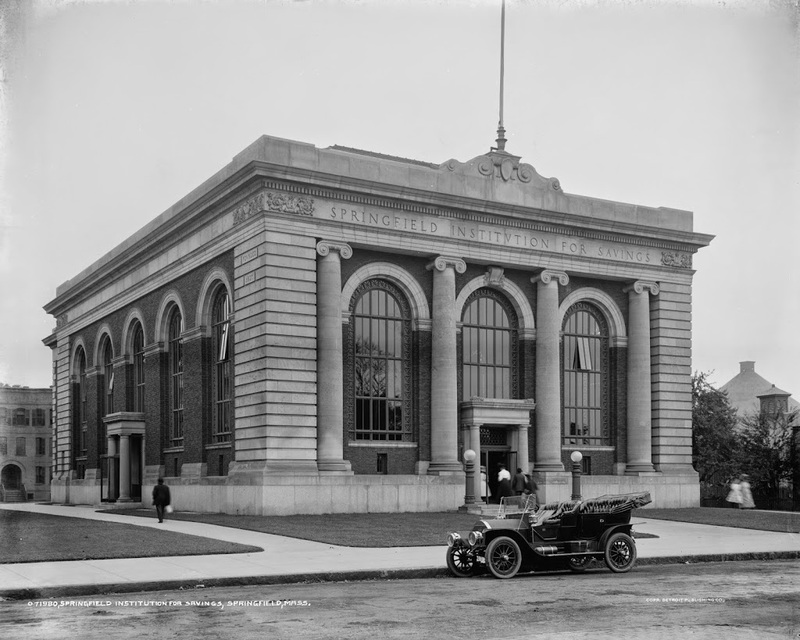 The Springfield Institution for Savings building on Elm Street in Springfield, around 1910. Image courtesy of the Library of Congress, Detroit Publishing Company Collection. 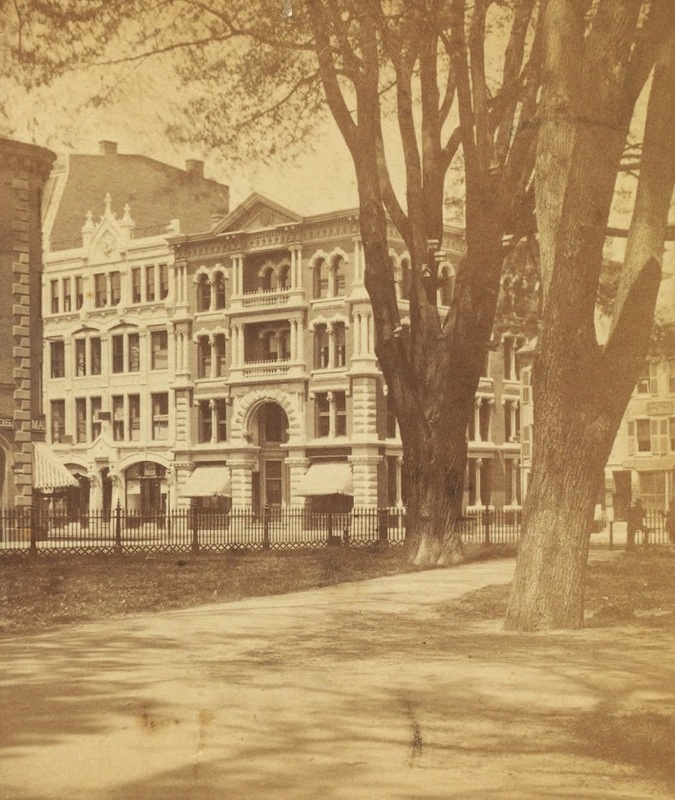 The first photo shows the former home of the Springfield Institution for Savings, one of Springfield’s first banks. 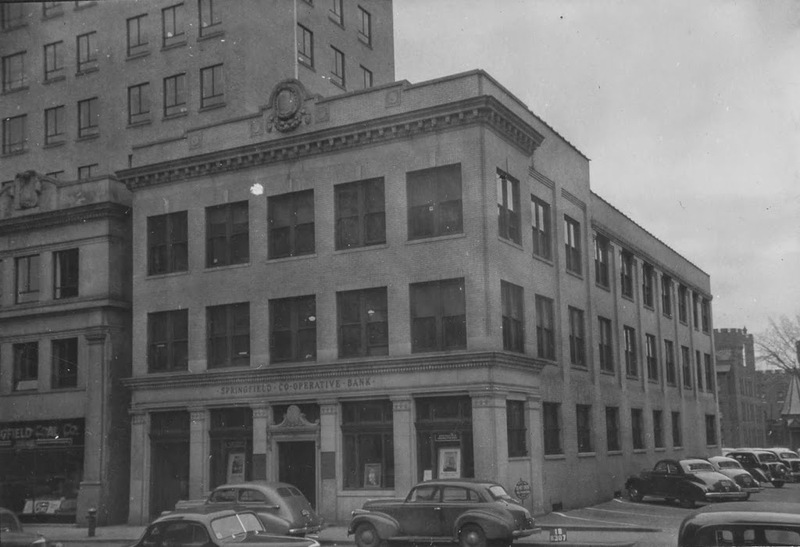 Today, the building no longer exists, and neither does the company. 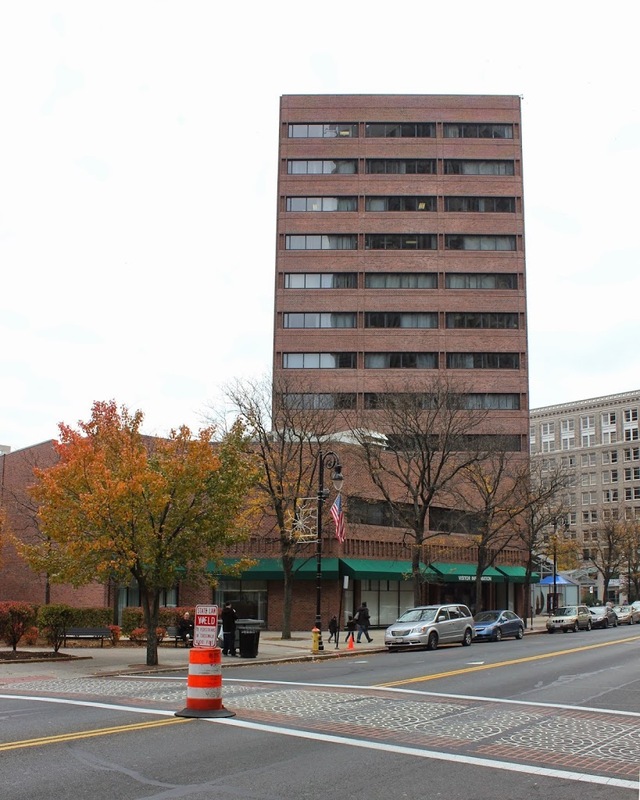 SIS is now part of TD Bank, and the site of the building is now part of the Hampden County Courthouse. Even the street that the bank was once on, Elm Street, no longer really exists. 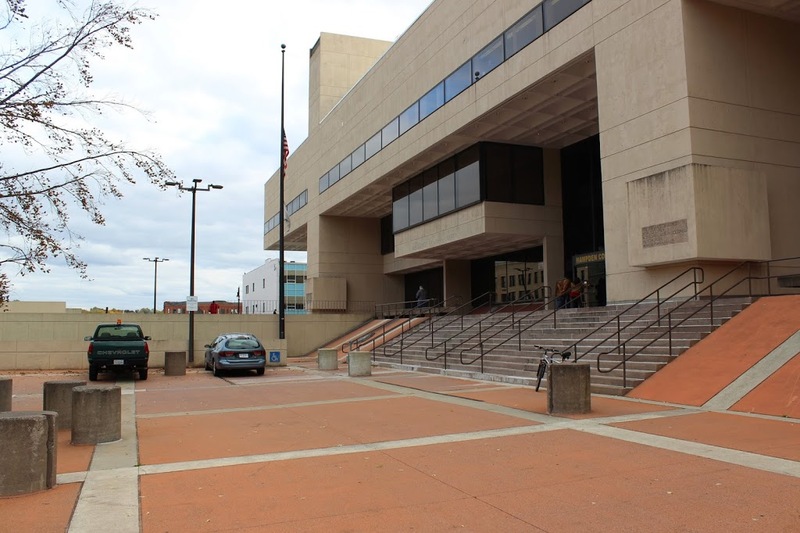 It used to extend from Main Street to present-day East Columbus Avenue, but the construction of the new courthouse in the 1970s caused the street to be truncated, and today it is a street in name only, as the section along Court Square is gated off, and the section next to Old First Church is essentially a parking lot for courthouse employees. 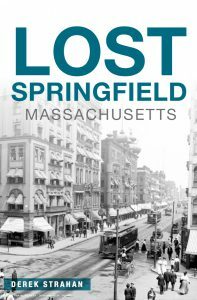 Along with giving us a clue as to the date (the license plate appears to read “1910”), it also shows an intriguing and long-forgotten part of Springfield history. The car was made by Springfield-based Knox Automobile Company, who made cars in the city from 1900 until 1914, and trucks until 1924. Their factory was on Wilbraham Road in the Mason Square neighborhood, right across the street from the Indian Motorcycle factory. 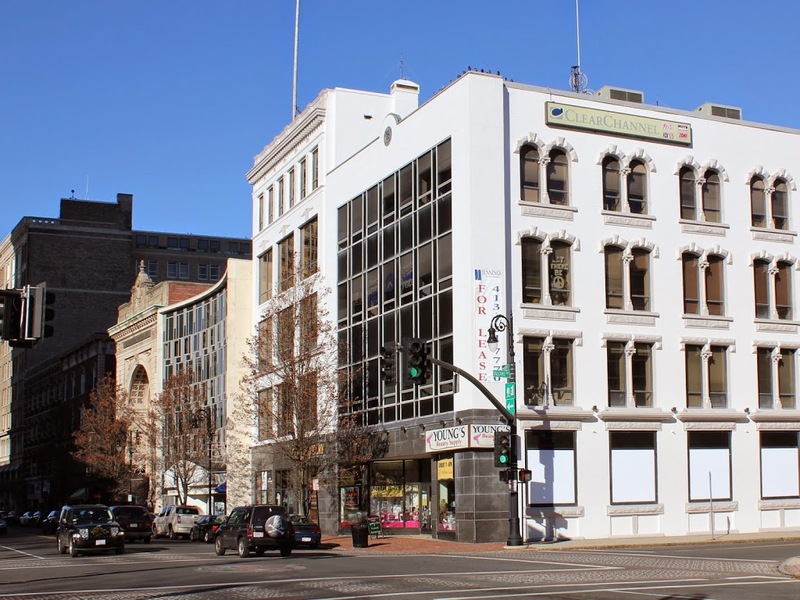 The Knox building is still there, although it is in pretty rough shape and was included in the 2014 list of Springfield’s most endangered buildings. I am fairly certain that the car in the photo is a 1909 Model “O,” although I am no expert on early 20th century automobiles, so if someone more knowledgeable than me knows otherwise, let me know. Assuming it was a Model “O,” though, it would’ve been $3,000 car 1909. Adjusted for inflation, that would be over $75,000 in 2014 dollars, so the owner would’ve been a fairly wealthy person. Today, though, cars don’t look like that, as the pickup truck and station wagon bear witness to in the 2014 photo. 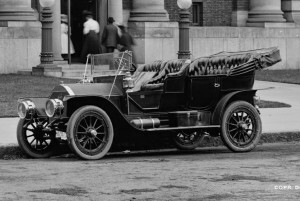 However, at least one 1909 Knox Model “O” still exists today; this article explains the process of restoring the car and includes plenty of post-restoration photos.